MightyB! » Blog Archive » Ortiz does it again!!! My brother and I went to the Sox game on Monday and in dramatic fashion, David Ortiz won the game with a hit in the bottom of the 12th!! 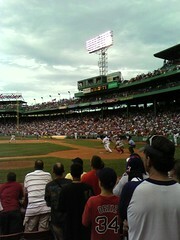 This was just two days after he hit a HR to win it again for the Sox. ← Every Lost mystery to date in one site! Sources just like the one you merely mentioned here can be really helpful to me! I’ll url to this great site on my site. Thank you for dropping that link, however, it’s broken.